It's our birthday and we want to celebrate! For over 25 years, BUST has been releasing content that pushes feminism, equality, and inclusion forward. We take pride in the number of influential, inspiring, and hard-working feminists we have had the chance to collaborate with over the years. In order to honor the hard work and love that has gone into BUST with the combined help of staff, contributors, and of course our subscribers, we are throwing a party—and you are all invited! Join us Tuesday, August 28th at the iconic House of Yes (2 Wyckoff Ave, Brooklyn, NY) for a party you won't want to miss. A portion of all ticket sales donated to the reproductive rights organization NNAF National Network of Abortion Funds. Comedian and actress Jenny Slate will host and entertain between our Golden Bra Award presentations. The event will also feature comedy from Aparna Nancherla and Patti Harrison, an appearance by Amber Tamblyn, a special DJ Set by DJ Low Down Loretta Brown (aka Erykah Badu) and so much more! The Golden Bra Awards will be presented to some of our favorite luminaries in women’s culture. Past recipients include Gloria Steinem, Kathleen Hanna, Margaret Cho, and Jean Grae. And to keep the party going, we will feature a number of musical acts, including Miss Eaves. General Admission is $40. The first 100 people to walk through the door will get free swag bags! 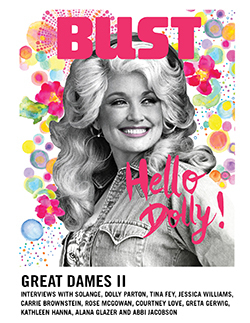 A 1-year subscription to BUST Magazine. Special issues from the archives. The chance to come up onstage with us and wish us a happy birthday! Meet-and-greet with BUST's founders and publishers Debbie Stoller and Laurie Henzel and the rest of the BUST team.